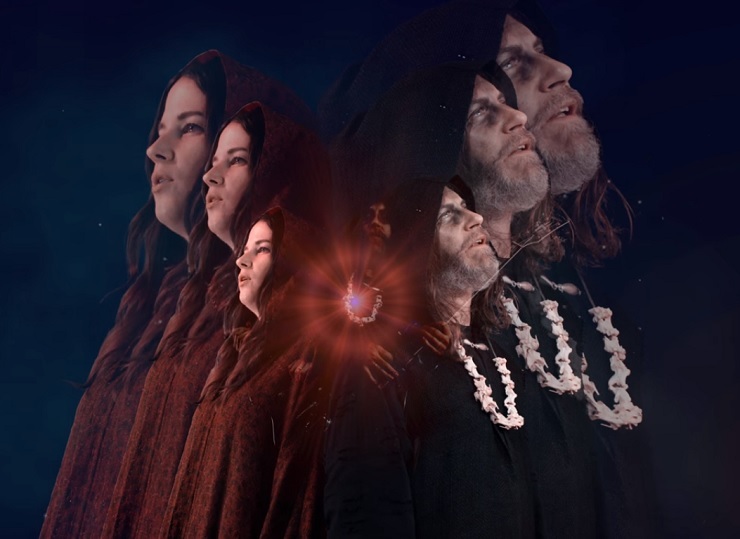 With Black Mountain having recently announced that they're set to make a comeback via the launch of this spring's IV, the band are now letting us take a peek at what all goes down at their namesake peak in a new video. Full of bizarre rituals and massive riffs, the clip for the record's "Mothers of the Sun" is streaming now. At first, we see a projection of a cloaked and double-guitar toting Steve McBean blazing out stoner licks in front of the mountain. Inside a cave, other band members are freed from shackles after being sermonized by a cave painting. There's also some knife play, an inter-dimensional shift, plenty of jamming, and a few skin-baring chores on display. You can catch the rest of the Black Mountain madness below. As previously reported, IV drops April 1 via Jagjaguwar and will be supported with a world tour. You'll find info on the dates over here. UPDATE (02/12, 1:25 p.m.): It's been announced that Black Mountain's IV wil arrive via Dine Alone in Canada.